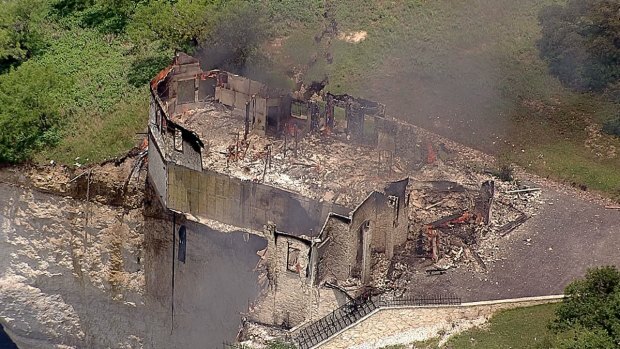 Rather than wait for it to tumble into the water, fire crews burned down a luxury home teetering atop a crumbling 75-foot limestone cliff over a Central Texas lake Friday. 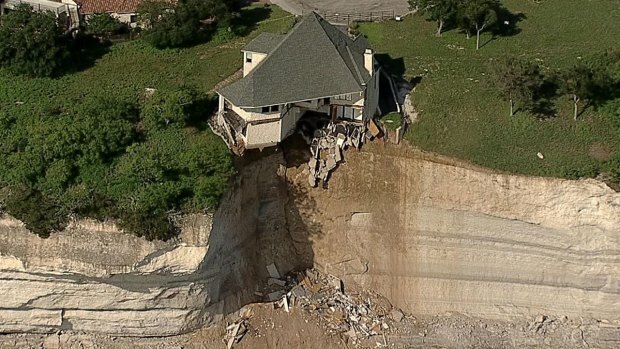 Chunks of both the cliff and the home have been falling into Lake Whitney in recent days, ushering in a sense of urgency with regard to how to safely remove the condemned home before Mother Nature inevitably pulled the entire structure into the lake. 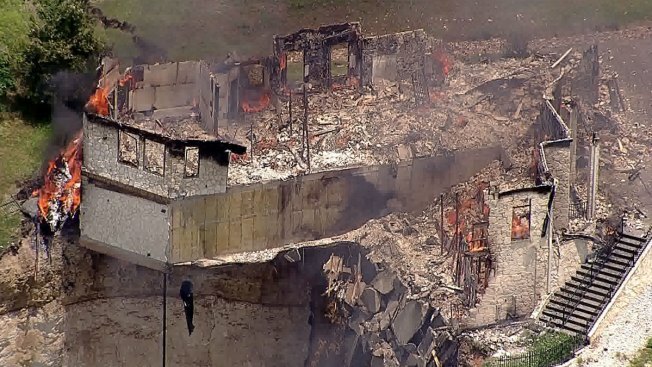 The homeowners, Robert and Denise Webb, who are in Florida, decided Thursday the best way to remove the $700,000 4,000-square-foot home was to burn it to the ground. At about 10 a.m. workers could be seen bringing three bales of hay into the garage along with a gallon of gasoline. They then began breaking out windows and partially knocking holes in some walls to help the fire spread. The hay was then saturated with diesel fuel and scattered around the inside of the garage before being lit at about 11:45 a.m. After only a few minutes, flames had overtaken the garage and smoke was visibly spewing from the eaves. An hour after the fire was started, most of the home had been consumed by the fire. 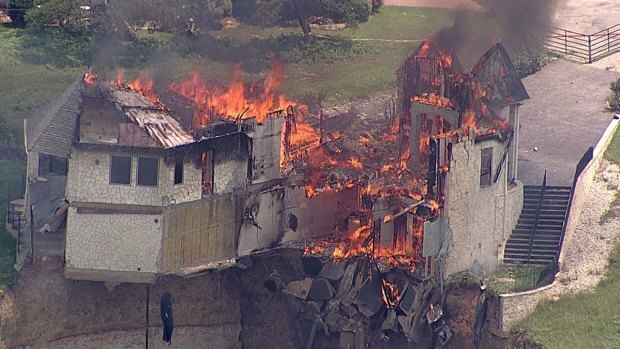 This timelapse video of Lake Whitney house burning to the ground. Spectators in dozens of boats witnessed the demolition from a safe distance. The Webbs bought the home on the 1200 block of Overlook Court in 2012, but a few weeks ago were forced to remove their personal items and relocate after they noticed large cracks in the walls that led to the home being condemned. The family, who also have a home along Florida's Miami Beach, told WTSP-TV on Thursday that the deterioration of their property has been hard to watch. "You know, that's my life there that we're watching fall off," Robert Webb said the day before the demolition. Geologists and inspectors had told them before they purchased the land that the property was perfectly stable, "and so we bought it in good faith," Webb said. The house, built in 2007, was to have been left to his grandchildren, he said. "It's really tough, that house was special and I don't even know why it was so special but it was special to me," Denise Webb said. 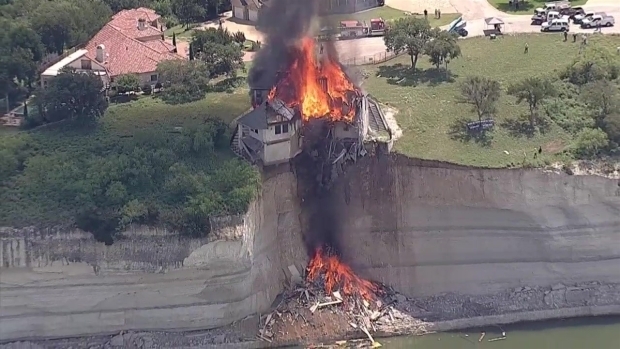 A large home built on a limestone cliff overlooking Lake Whitney will be intentionally set ablaze and destroyed Friday morning, hopefully before another landslide drops the home into the water. Randy Cephus, with the U.S. Army Corps of Engineers, confirmed to NBC 5 Thursday that the homeowners had three options for removing the home from the site before it falls into the lake. 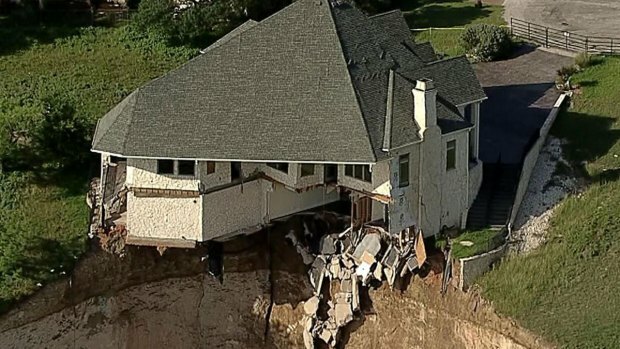 The first option was to wrap the home with a large net and then pull it away from the edge of the 75-foot cliff, so that the debris could be safely removed from the site. That option was determined not to be feasible, leading engineers to consider the second option — burning the home to the ground. 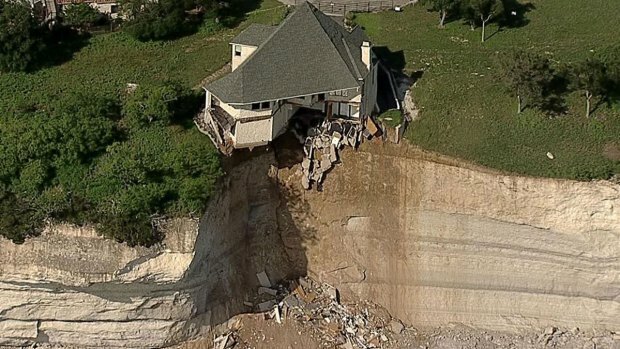 A large home built on a cliff overlooking Lake Whitney in Texas is in danger of falling into the lake, after a large chunk of the ground beneath the home slid into the water below. Officials did consider a third option: Letting Mother Nature eventually claim the home through landslides. The last option, which would likely include removing debris from Lake Whitney, is also the most expensive option. "You hear about landslides happening in California," said Kari Poole, who lives in nearby Whitney. "But not in Texas. Not on Lake Whitney. Not where you live." No matter which course of action was chosen, the homeowner, who is in Florida believed to be tending to a family matter, will be responsible for the financial cost of the cleanup and removal of the debris. NBC's Julie Fine, Scott Gordon and The Associated Press contributed to this report.